Highland Games – the true tradition? 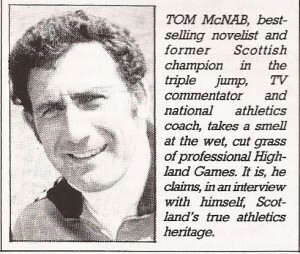 The September 1986 issue of “Scotland’s Runner” had an interview with Tom McNab about the Highland Games and their place in Scottish athletics. I thought that it was a very good article and so am reproducing it here. There have been many changes since 1986 – the demise of the SAAA, the arrangement that ‘amateurs’ could now compete against professionals and accept money as prizes being the main ones. But there is a lot in the article about the Games that is genuine history, and a lot that still rings true. Read and see what you think! When did you attend your first Highland Games? Paradoxically it was a lowland games in Wigtonshire back in 1949. But it was essentially a Scottish rural meeting, coming from the same roots as the Highland Games. I was a lad of 15 tattie-howking with my schoolmates for a few bob, and there was this local meeting with prizes of about ten shillings for a win – a fortune. I seem to remember that I won the high, and hop, step and leap and got second in the long jump. Primitive! There were no pits for any of the jumps. I could just about handle it in the high jump, but I was scared stiff in the long jump. No pit, no take-off board – I think I cleared just over 5 metres. I cleared about 1.50 metres in winning the high jump (the commentators called me ‘the new Alan Paterson’!) and, more significantly, close on 12 metres in the triple. Were you aware that this was a ‘professional’ meeting? Dimly, in a young boy’s way. I knew it wasn’t the same as Shettleston Harriers … sort of sensed that this was forbidden territory. It was handicap athletics and the best sprinters weren’t capable of much better than 10,5 seconds for 100 yards off scratch, but there was a fellow called Hugh McCaull (I’ll always remember his name) a good looking local lad who could run 4:25 for a mile, a cracking time for those days. And your first proper profesional Highland Games? The early 1950’s. That was when I first saw Jay Scott, one of the three greatest natural all-round athletes I ever encountered. Daley Thompson and a Scottish amateur of my period, Bill Piper. What was Jay Scott capable of? He cleared about 1.90metres in the high jump, just short of 7 metres in the long jump, and just over 14 metres in the triple. But he could also throw 14 metres in the shot, run a hundred yards in close to evens, and toss the shafted hammer about 37 metres! These are good marks but dn’t look fantastic by today’s standards? No, but you must remember the conditions under which they were performed, football pitches or more often rough farmers’ fields. Jay Scott was, in my view, one of the greatest Scottish athletes of all time: no question of it in my mind. He seems to have made a great impact on you? Jay Scott had a wonderful athletic charisma. He was the essence of athleticism, tall and good looking, with a beautiful animal quality in all his movements. He was simply marvellous. Who were other Games athletes of the period who impressed you? Bill Anderson; he was wonderful, still is; to me he is the essence of the Games. The speed he used to get in that hammer-head! His throws of 151 feet with the light hammer and 123 feet with that great pudding of a 22 lb hammer were magnificent. 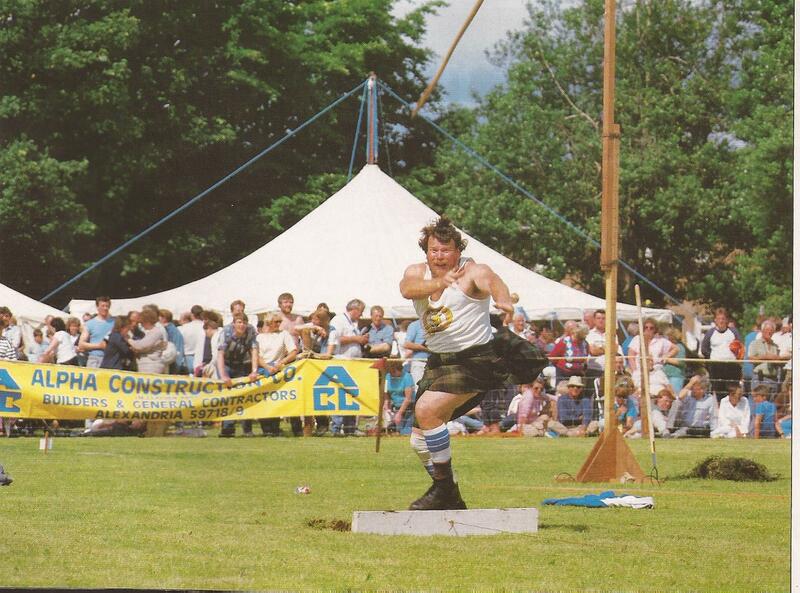 Did you compete in any amateur Highland Games? Yes, but most were professional at that time. The amateur sports meetings of the period were essentially footracing and cycling meetings with an occasinal high jump (the Alan Paterson ‘boom’) thrown in. I competed in the first and last Helensburgh Highland Games in 1961 – I cleared juts over 13 metres (which put me fourth in the British Junior rankings!) winning in the final round against a Glasgow University chap called Goudie. The first major Games I competed in were the Edinburgh HIghland Games at Murrayfield in 1952 – I remember beating the American pole-vaulter Bob Richards in the hop, step and jump. But you always felt drawnto the professional games? Yes, at first on an instinctive basis – there was something ‘real’, something of my Scottish roots in them. Later in the mid-50’s when I spent countless hours in the Mitchell Library going through 100 years of Highland Games results, I realised why I had this feeling for the Games. For they were Scotland, they were where the sport of athletics had come from. What did you find out in your studies? First the depth of the roots. The Games probably go back to the 14th century but in their modern form they are about 150 years old. the ‘boom’ in Highland Games came first with the development of the railway system in the middle of the century and second with Queen Victoria’s residence in Scotland. What were the 19th century performances like? Very difficult to know. Certainly the great Donald Dinnie tossed close to 50 feet in the shot and about 130 feet with the 16 lb hammer. Dinnie also went close to six feet in the high jump before he broke his leg at Rothesay Games. He was a magnificent all-rounder, simply unbeatable from 1867 to 1890 in everything from caber tocatch as catch can wrestling. He took Highland Games to America, New Zealand, Australia and South Africa. 1917, alas in very poor circumstances. Dinnie had made massive sums during his career which ran fr well over thirty years, but he was a bad businessman and lost several fortunes during his lifetime. During the first world war, one of the shells which was fired upon the German Army was called a Donald Dinnie. So the standard of throwing was high? Yes, there were probably more putters capable of 14 metres in 1900 than there are now! Tivendale was credited with 6’1″ before the amateur Brooks cleared 6’0″ in 1876 but Games high jump performances were always doubtful. There were a fair number of jumpers in the 5’8″ to 5’9″ area in the last three years of the 19th century, and an occasional pole vaulter over 11’0″ and an odd lng jumper over 22’0″ But it was the triple jump that was really rich n performance. The great Hogg of Hawick cleared 49′ 9″ in 1893 and Sam Muir was credited with a more doubtful 50′ 6″ in the first years of the century. I have notes of several occasions particularly in Southern Games of events in which there were several jumpers over 46′ 0″ in the same competition. How many meets were there every week? Every Saturday there would be anything up to eight recorded meetings running from the ‘true’ Highland Games in the north to such events as the Shettleston National Games and the Border Games. How did the Border Games differ – I notice you seem to class them as Highland Games? I do so because they are the same sort of rural Games. The only athletic difference is that they didn’t have the Hammer and the caber. But they did have certain specifically Southern evens, all of which have vanished into the mists of history. The 6 lb ball throw – this must have been thrown like a javelin. Then there were the standing jumps and the hitch and kick. This involved jumping to kick a suspended sheep’s bladder with your take-off foot, then getting your foot back on the ground. How high did they jump? 9′ 4″ was the best Scottish jump of which I have record, but the great Irishman Mike Sweeney (inventor of the Eastern Cut-Off) cleared 10′ 4″ in New York at a Highland Games. So what happened to the Southern Games? They seemed to die after World War One. The War destroyed a whole generation of young men of the villages in Southern Scotland and their games seemed to die with them. But the Highland Games survived? Yes. By the early 20’s they were back in full flower. I met George Clark, onbe of the throwers of that period, a couple of years back. He was putting 46′ and throwing 120′ in the hammer back in the 1920’s and 30’s. He was still competing in the early 1950’s and was the first throw the Braemar Caber when he was over 50. A wonderful man! 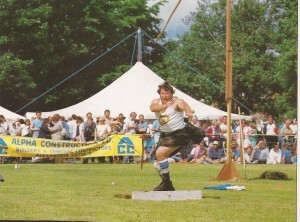 Clark is a classic example of the ‘agricultural strength’ of the classic Highland Games athlete. Yes. It’s the type of strength gained through daily manual labour, quite different from the elastic strength of the modern weight-trained athlete. I asked Clark if there was any athlete of his period who could compare with the modern throwers. He said only one, the great AA Cameron who had retired by the 1920’s when Clark was coming to his best. Cameron was credited with a putt of 55′ 8″ back in the early 1900s. No, if only because it in no way relates to his other putts which were in he sub50′ area. Indeed there is no record of Cameron ever putting over 50′ with a genuine 16 lb shot on level ground. But he was clearly a magnificent athlete, regularly clearing 5′ 0″ in the standing high jump. How popular were the Games in the nineteenth century? I estimate that on any one summer Saturday there were 30,000 – 40,000 people watching up to 15 Highland Games. They were immensely popular stretching down into England with such events as the Manchester and Liverpool Highland Games, and abroad to the United States in the mid 1840’s. What impact did the amateur movement of the 1880’s have? The main impact of the amateur movement lay in Central Scotland. In the rural areas things went on as before because the amateurs were essentially city based harriers. They created pale versions of the Games throughout Central Scotland – essentially handicap running withcycling and an odd field event. The amateurs ignored the rich tradition of field events of the Games and there fore when we entered the Olympic movement, we suffered immensely and have done so until relatively recently. Do you think the 19th century amateurs should have tried to evangelise, to ‘amateurise’ the Highland Games movement? Hindsight is an exact science! Yes, they should like the Football Association and the Jockey Club have tried to embrace all of athletics and thus would have organised and purefied the ‘professional’ element of the sport. This would have meant that they could have regulated and controlled all aspects of athletics, and as it ‘opened’ out in the post World War II period, could have dealt with its entire population. The same could of course have been said of the Amatuer Athletic Association. But do you think that the Games could have survived control of the Amateurs? Probably not! I think the local and essentially primitive nature of the professional games movement is what has enabled it to survive. That is after all what makes the Games unique. How did the Games survive World War II? Because of the efforts of one man, Tom Young, who formed the Scottish Games Association in 1947. More recently with the death of Tom Young, the responsibility has been taken up by Andrew Rettie and although his task has not been the same as that of Tom Young he has been the mainstay of the Games movement. The SGA, though it created event rules and the code of conduct for the foot-racing competitions such as the Powderhall Sprint, cannot be compared with the Scottish Amateur Athletic Assciation because it is essentially a loose assembly of games organisers, rather than a governing body. John Freebairn, who was still competing in the Games at around 50 and is now a re-instated amateur, said that there would be no landing areas for high jump and pole vault. Do you agree with this? Yes I do. What makes the Highland Games unique is that they have stayed the same for centuries. If you want to see people running round a tartan track or flopping on to a foam landing area, then the place to go is a conventional track and field meeting. But the test of the Games is to compete in simple natural conditions and to adapt to these conditions. Do you think the Games will survive into the 21st century? I’ll put my savings on it, just as long s they are not taken over by the SAAA! But one great problem is that the rural culture which in the past produced throwers and jumpers has dried up. The present crop of ‘heavies’ averages about 45 years of age – at 38 Geoff Capes is one of the youngest – and there is little sign of any big crop of youngsters coming up. As for the jumps, many Games no longer have a pole vault, and there is a steady decline in this area of light field events. Eveangelical work in our country areas with courses for youngsters in the traditional events, using as coaches such ‘greats’ as Bill and Grant Anderson. Junior and Novice events in all our major games, possibly sponsored. Otherwise these events, the core of the Highland Games, will probably fade away. Did the Games ever at any time offer an athlete a full time professional career? No, never. That’s what has always made a nonsense of the ‘professional’ tag. At best, the cream of the ‘heavies’ were able to take a few months off farming to compete. Nowadays, even with the increase in the number of Games available, prize money has not kept pace with the cost of living, and a top’heavy’ even if he wins every event is lucky to clear £100 at a meeting. Do you think that the Highland Games athletes should be able to compete for ‘amateur’ clubs? Of course! The £90,000 Zola Budd earned for finishing fourth is more than the prize money in all the Scottish professional HighlandGames in the whole season put together! So it is clearly a nonsense to ban the handful of mainly rural athletes who compete in the Games. But isn’t this the problem for the SAAA, that there is handicap footracing, on which betting occurs, as well as scratch competition in field events? Betting rarely takes place in Highland Games, and even if it did, more money was laid at Ladbrokes and Hills on the results of the last three Olympics than has been laid on all of the British footracing competitions since the last war! Thus, the attitude of the ‘amateur’ to professional footracing is, like fear of vampires, quite irrational, and has no place in modern sport. What is the present state of the Games? In terms of the sheer volume of meetings, probably the best since 1913. In terms of the volume of athletes, particularly in the ‘heavy’ events, not so good. What are the performance levels? In the ‘heavy’ events, they are quite good, though there is no depth. The problem as I said before is that the ‘heavies’ are mostly middle aged! Capes could undoubtedly go beyond 61′ 0″ again if he got back in shape, and Grant Anderson is capable of going beyond 150′ with the shafted hammer, but most Games can be won with distances 10% – 20% short of these. The jumps are at about the same level as the 1930’s, while the sprints and distances are usually merely good club level, in the even time area in the sprints and mid 1:50’s in the 800 metres. But the Games are not about perofrmances rather are they a unique mix of athletics, piping and dancing, Scotland’s gift to the world. There is nothing like them anywhere in the world and they are something we must cherish. But Scottish officials were strongly against even a demonstartion Highland Games at the Commonwealth Games were they not? Such people must ask themselves – what do the Highland Games now represent; indeed what have they always represented? The Games are the essence of recreational athletics and awlays have been. In these days of ‘subvention’ and subsidised athletes they more accurately represent the true heart of Scottish recreational sport than much of ‘amateur’ athletics. The pose about as much threat to ‘amateur’ athletics as the bubonic plague now does to public health. What do you feel like nowadays when you watch a traditional Games? I look at the ‘heavies’ like Bill and Grant Anderson, and see an unbroken thread to the past, back to Jay Scott in the 1950’s, Clark in the 1930’s, AA Cameron in the early 20th century and the great Donald Dinnie in the 19th. I see a culture that Scotland has given to the world, one to which the great athletes of the past could return and recgnise and enjoy. That’s not something you could say of any other sport. When I attend a Games I remember that wee McNab of 1949, smelling the wet, cut grass of a Games field for the first time, and I hope that 20 years from now that it will be still the same.